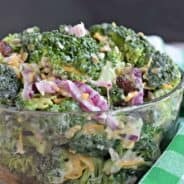 Looking for a snack idea or the perfect side dish to dinner? 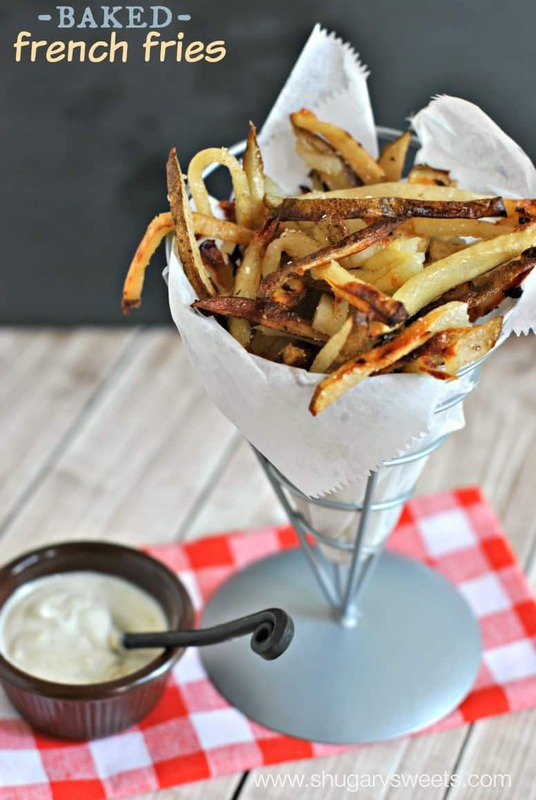 These Baked French Fries with Blue Cheese Dipping Sauce are delicious! Stop what you’re doing. Right now. Did you stop?? Good, I have your attention? Phew. I had to get that off my chest. Can you tell I’m a little excited about today’s recipe? Here’s the deal. A few months ago (okay, last fall) we met some friends at an outdoor music festival (great indie bands). We enjoyed music for hours together. But, more to the point, we enjoyed food. Delicious, FOOD TRUCK, food. You know, the kind of grub that comes off a truck and you think “OMG this is the best pork sandwich I’ve ever eaten” food. And one of the things we ate (and ate again) were some homemade potato chips with a hot blue cheese sauce. I ate two huge plates of this it was so good. The chips had a sweet hint of cinnamon and sugar, and the blue cheese sauce was warm served over the top! I then came home and tried to recreate this dish. Except I knew I wanted to do it with baked french fries. You know, to keep it healthier! ha! These were crispy, and amazing, and Healthy (ish). And then, came the blue cheese dipping sauce. DO NOT SKIP THIS. I’ll be honest with you guys. I’m not a huge fan of blue cheese dressing. There are times when it’s important (like with buffalo chicken dishes), but it’s not something I crave. This sauce though? Yeah, just looking at these photos makes me want it again. So there you go…make this now. For game day. For dinner. For dessert. And let me know what you think! Delicious baked french fries with a homemade blue cheese dipping sauce! Preheat oven to 450 degree F. Scrub the potatoes clean and dry completely. Cut potatoes lengthwise into thin strips (about 1/4 inch thick). In a small bowl, combine 1 tsp kosher salt, 1 tsp cinnamon and 1/4 tsp nutmeg. Set aside. In a large bowl, combine cut potatoes with olive oil and remaining 1 1/2 tsp kosher salt, 1 1/2 tsp sugar and 1/4 tsp nutmeg. Mix gently. Pour potatoes onto a large baking sheet (in a single layer as much as possible). Bake for 45 minutes, using a spatula, turn the potatoes over on the baking sheet every 15 minutes. 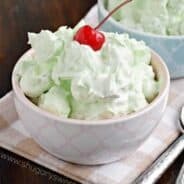 While the potatoes are cooking, prepare the dressing. Combine all the dressing ingredients into a small saucepan. Simmer over low heat until smooth and warm. Keep warm until ready to serve. This may also be heated in the microwave. Remove potatoes from oven and immediately sprinkle with cinnamon mixture. Serve with blue cheese dressing. Love french fries? 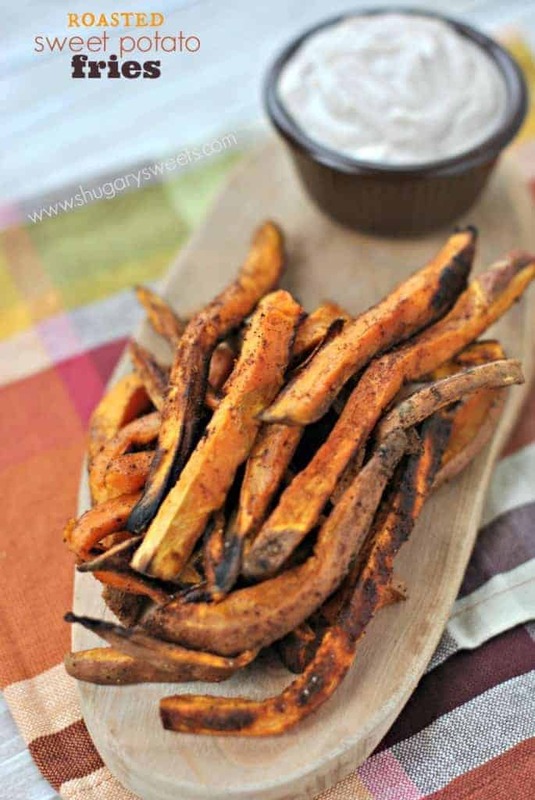 These Sweet Potato Fries are a wonderful twist, baked in the oven and served with a sweet cinnamon dip! 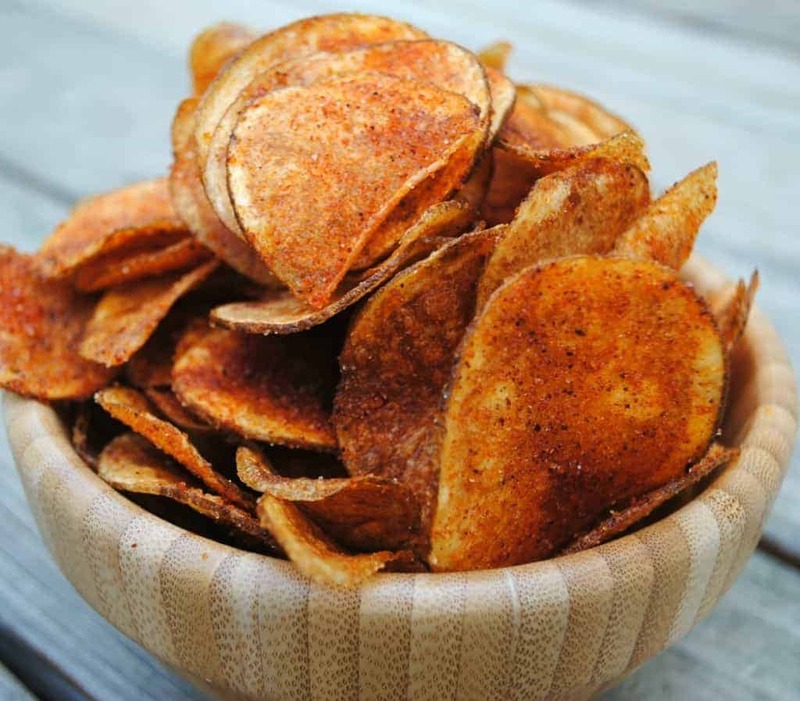 Homemade BBQ Potato Chips are easier than you think with this recipe! Wow, this looks so good! So much better than what one would get eating out. This is brilliant. Cinnamon, sugar, bleu cheese? Yes please! I love that they’re baked, too! Ohhhh man. My weakness….french fries. (Love that these are baked for guilt-free eating.) I usually eat mine with ranch, but now I definitely want to try this homemade blue cheese! These look so golden and crispy! 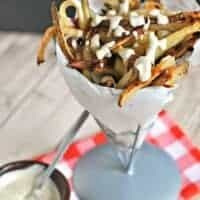 I love homemade french fries, even better if they are baked! The blue cheese sauce…. LOVE. This is such a great snack! 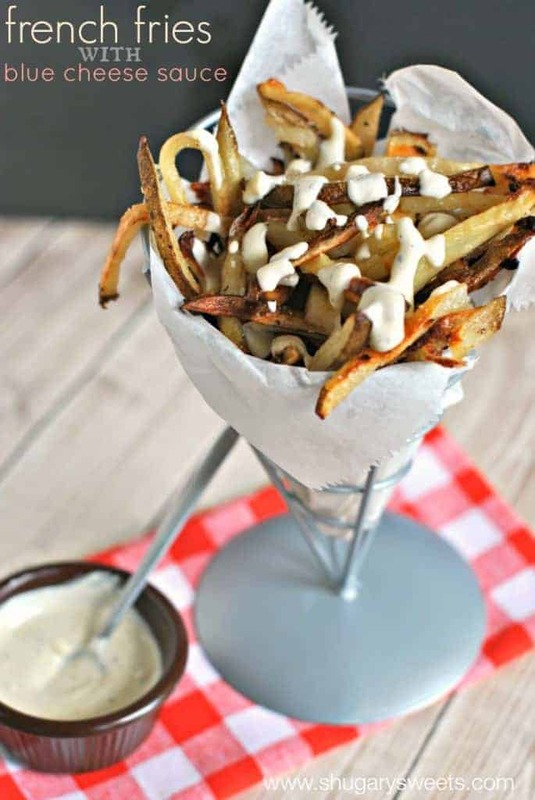 I would not be able to resist those fries with that divine blue cheese sauce! I bet it would be delish drizzled on steak too! Well any french fry I see after this will be totally lame! These are fantastic Aimee, and that sauce is incredible. I love potatoes and blue cheese; a winning combination. I love that these are baked and the blue cheese dipping sauce sounds so good. Such a great combination! 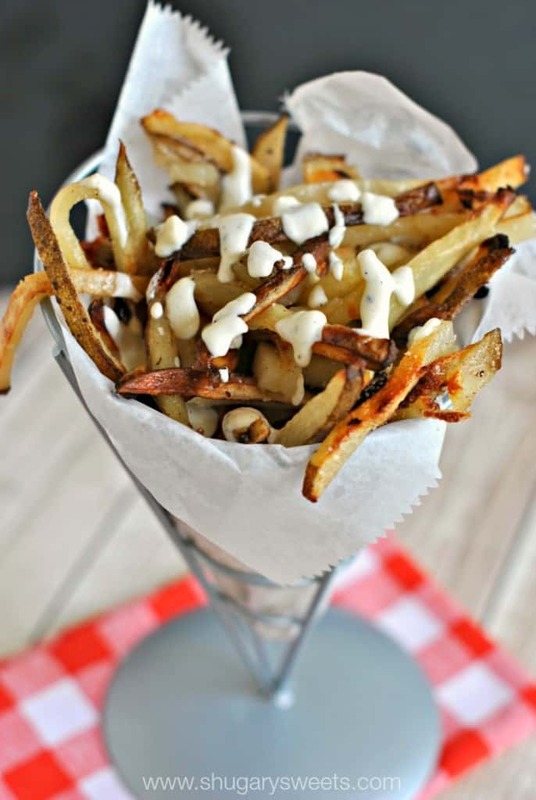 Never been to a food truck, but I’ve been to french fries and blue cheese! I’m all over this one!! Thanks for sharing! food truck food is always the BEST! but man these fries are making my stomach growl, as in they need to happen at some point TODAY!! 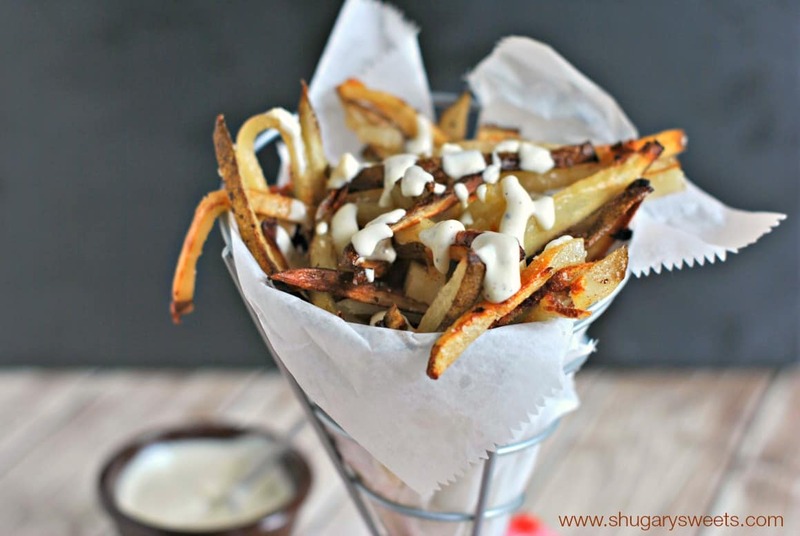 These fries are snack perfection!!! Honestly, if it came off a food truck, it had to be the best thing ever. You had me sold at the title, mind you, but wow. I am going to make these part of Friday night! Food truck food is seriously the best!!! Now I’m not a big blue cheese dressing fan either…so I’m going to trust you when you say I need this in my life. That cup of fries is definitely calling my name!! Sweet and salty is totally my jam! Why is it that food truck food is so good?! It never fails. There was food stand outside of our Lowe’s when we live in TX. I mean, the guy literally parked his little truck right by the exit doors so that as you were checking out you would get a whiff each time the doors opened. I could not leave that place without buying a cheese steak. These fries though, I bet they are better than a food truck! They look incredible! How did you know that fries are my weakness?? As in, I can never stop eating until they’re all gone. Literally. And then I’m craving them as soon as I’ve finished. It’s the worst. I haven’t tried blue cheese sauce with them before — I’m sure it’s deadly! Pinned! This looks amazing! I’m can’t get enough blue cheese! Mmmmm. I love love me some french fries.